Home Books and Accounts What are Balance Sheet Accounts? While looking at a company’s financials there are 2 types of general ledger accounts which are found, Income statement (a.k.a Profit and Loss accounts) and Balance sheet accounts. 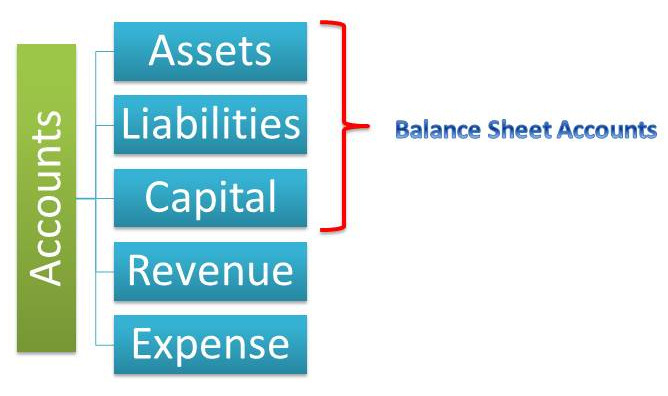 Balance sheet accounts are those which are related to assets, liabilities and capital. In other words all accounts which are related to balance sheet are balance sheet accounts, whereas other type of accounts i.e. income statement or otherwise called P&L (profit and loss) accounts are accounts related to expense and revenue items. Examples of balance sheet accounts include Fixed Assets, Accumulated Depreciation, Investments, Cash, Accounts Receivable, Paid-in Capital, Retained Earnings, Drawings, Accounts Payable etc. At the end of an accounting period Revenue and Expense accounts are not balanced instead they are closed with the help of closing entries and transferred to profit and loss account, hence they begin the following period with zero balance. Balance sheet accounts however are termed as permanent accounts because at the end of the accounting year the balances in these accounts are not closed and the year-end balances are carried forward to become the starting balances in the next accounting year. While most balance sheet accounts that need to be set up are common to all businesses, some depend on the type of business. For example, Inventory accounts are needed for those businesses which are into production and selling of goods however they may not be required for firms which provide services. This can be deduced from the account heads used in the financial statements like Closing stock, WIP (Work-in Progress), Finished goods etc. Apart from this, balance sheet also differs due to the nature of entity viz. Individual, Limited Liability Partnership, Company, etc. For example, for a company, the liability side of balance sheet would reflect Shareholder’s Capital whereas for a partnership, it would show Partner’s Capital.